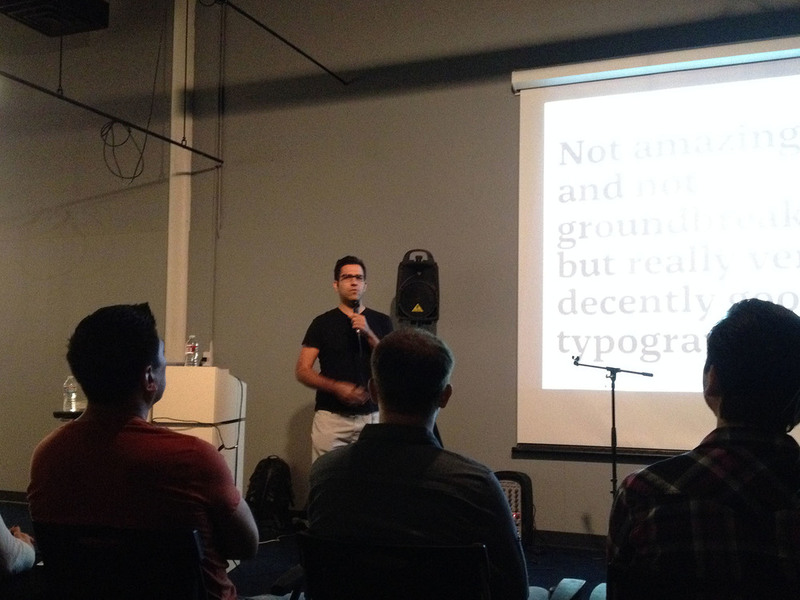 Armin Vit, from the fantastic website UnderConsideration visited San Diego, thanks to AIGA, to give an amusing and witty talk about his own work. He had the entire audience in stitches, laughing right along with his jokes and depreciating humor. The talk began with examples of his personal graphic design growing pains and typographic accidents - experiences so many of us have also had. In discussing his early work as a young designer, Armin talked about something that struck a chord with me: that sometimes we don't always love our older projects, and that perhaps its ok even to be frustrated by some of them. The growth and constant progress we as designers can make if we push ourselves, push the boundaries and try new things can make what has come to pass, seem.....stale. The first project that Armin showed, was a valuable lesson learned in kerning. A logo with a single word along the bottom presented two very unkerned letters. As he discussed his experience of this being brought to his attention, I will forever remember the hotdog graphic that popped up on the screen between the two letters. Everyone laughed, I laughed and I felt the room nod in understanding and recognition. Armin progressed through a series of his projects, working up to the most current pieces. As he talked and clicked through the images, it was inspiring to see Armin's passion for design and his intensive application of a grid beneath nearly all his designs. As he showed his latest pieces, Armin touched upon yet another point that resonated with me: that you don't necessarily have to be the best designer, you just have to be willing to work harder than everyone else. During the Question and Answer session, I asked Armin to touch upon his previous comments in interviews about how, sketching on paper is not a major part of his project's initial development. That instead, Adobe's Illustrator is where he begins the creative process, throwing up bits and pieces all over the art board. Overall, I felt that Armin's talk was both captivating and inspiring. I left with some fresh perspectives on 'always sketching on paper first', how applicable a grid can be under almost any design project and the memory of that hotdog stuck between two unkerned letters.